During the warm months of the year, I use the chicken run to start chicks. 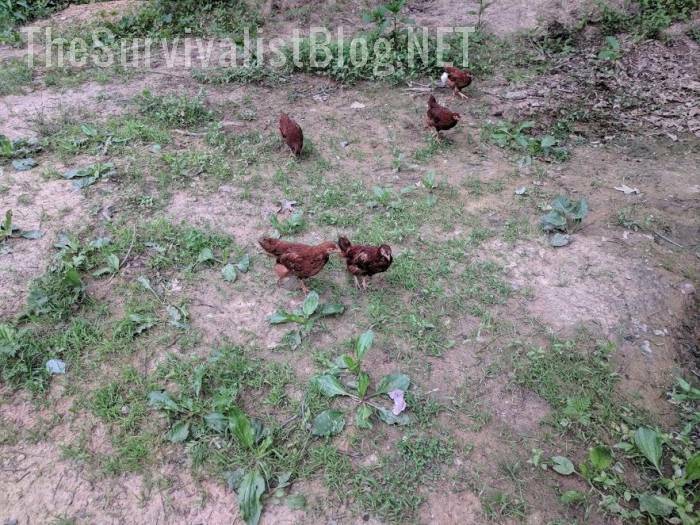 Because the run is attached to the coop and is centrally located in the barnyard, the chicks become familiar with their surroundings, the daily routing, and the other livestock. When the chicks are hatched on our survival homestead, I also place the momma hen inside with them. Once I had two hens (which were siblings) hatch eggs at the same time. Putting them all in the run, even though the hens had always gotten along, did not work out at all. One of the hens, Soup, immediately attacked her sister’s chick and had harmed it so severely I had to put it down. It only took me a few moments to unlatch the coop door and rush inside the run and grab the chick, but the damage had already been done. The normally friendly hen had pecked out one of the chick’s eyes and put a hole in her neck. After that experience, I moved the wood and wire 5-foot long brooder we use in the garage during the winter to hatch chicks, right next to the chicken run. Now if I have a similar hatching issue or happen to get a new flock member while another one is quarantined due to illness, I have the ability to separate the birds without completely removing them from their surroundings. Basically, I have two runs in the barnyard now and have put them both to good use frequently. 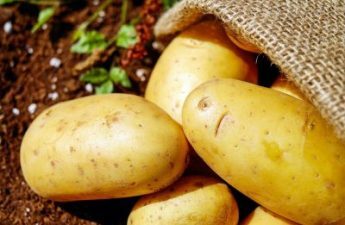 Having a second run or a single run with a divider door between the two could come in quite handy, especially if you want to breed specific lines of chickens, or start guineas, as well. I have successfully kept ducklings and chicks in the same coop and run but keets (guinea chicks) are especially small and fragile and get “squished” for lack of a better word, when mixed in with other poultry. Some chicken keepers put a wire bottom on their run to better deter predators. Because our backup run began solely as a brooder, it has wire mesh on all four sides. 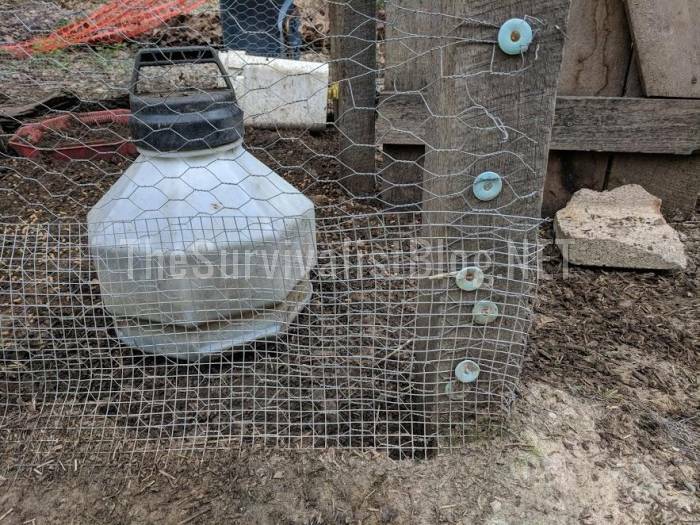 Although the wire mesh can definitely help keep out predators, it also creates a haven for droppings and bacteria to grow when used as a permanent and not simply a temporary run. 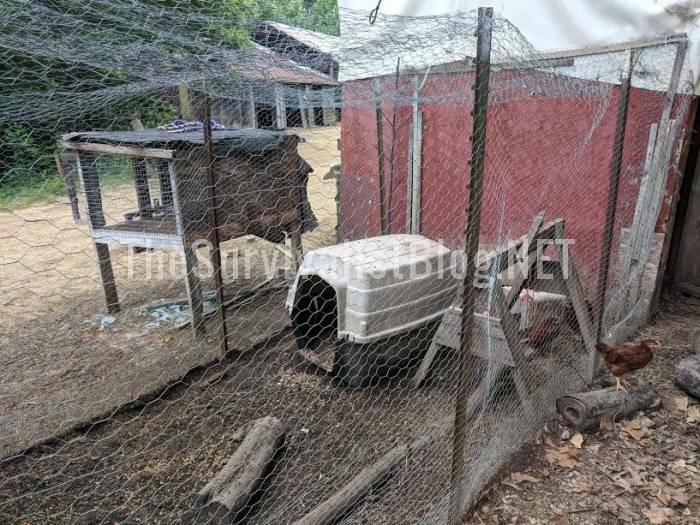 For our chicken run we dug out a foundation to match the dimensions desired and then laid down a piece of hardware cloth (the same wire mesh fencing used to make rabbit cages) and then placed some sheet metal and bricks on top of it. Once the foundation covering designed to deter burrowing predators was in place, we filled the approximately 8-inch deep trenched foundation area, in with dirt. The dirt was then leveled and the chicken run posts, walls, coop door and a human door, were built around it. Chicken wire is great for keeping the flock in, but horrible for keeping predators out. A mink can wiggle through a hole the size of a dime when motivated by hunger. Chicken wire is far too large and pliable to keep a determined mink at bay. A clever raccoon also possesses the ability to reach inside the wire to grab a chicken as well as the strength to pull on the chicken wire openings to enlarge them enough to reach inside far more deeply. 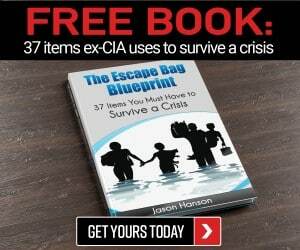 Hardware cloth is more sturdy than chicken wire and boasts much smaller openings. We attached and overlapped hardware cloth around the human door to prevent predator entry that could occur if exposure to the elements caused the posts or door to separate over time. 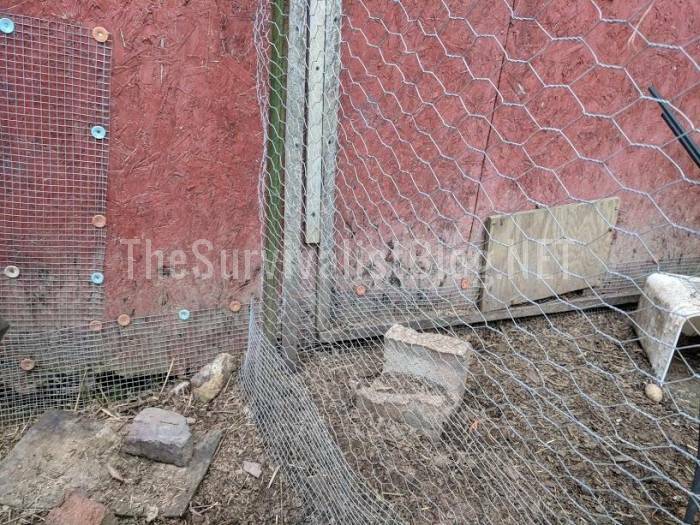 A bungee cord with hooks on either end secures the hardware cloth flap to the side of the chicken run. 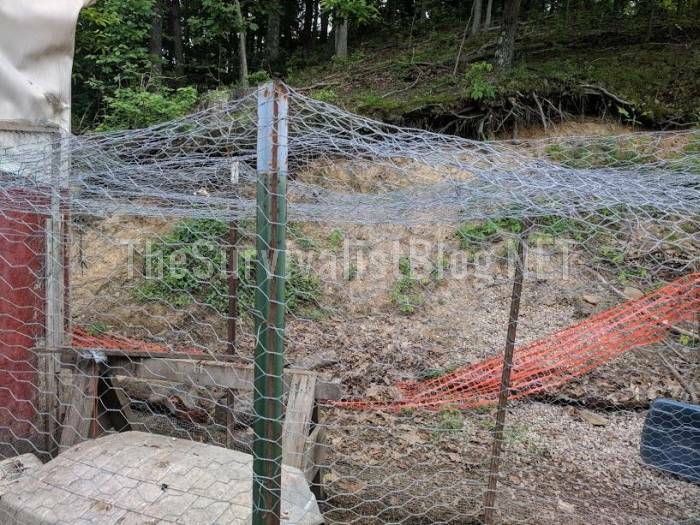 A layer of chicken wire was trenched 12 inches from the bottom of the run all the way around to better protect the double layer of chicken wire it was covering. 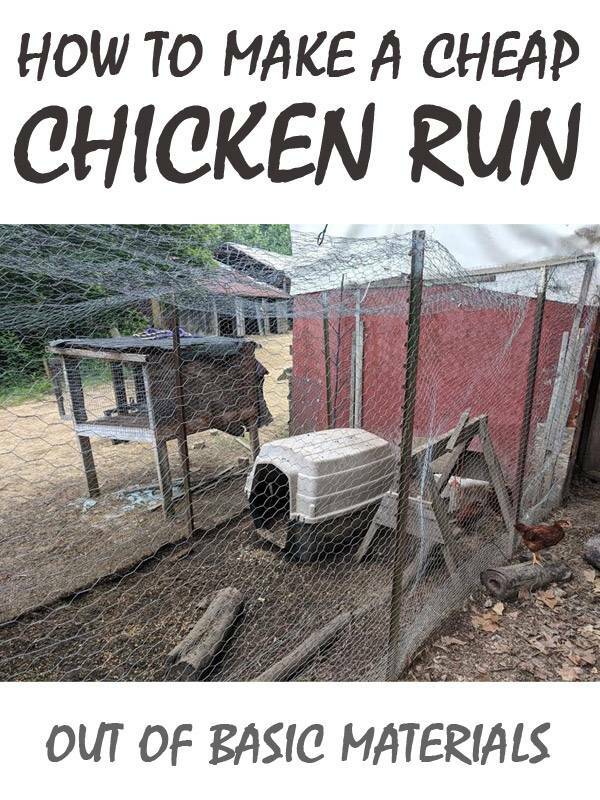 If I was using the run to house my flocks on a daily basis and not simply for brooding and quarantine, I would have dug more deeply into my pocket and purchased enough hardware cloth to cover the entire run and not used the less expensive chicken wire at all. A trench 12 inches wide and 12 inches deep was also dug around the perimeter of the chicken run and lined with hardware cloth to further deter entry by digging predators. Either wood or metal T-posts, or a combination of both, are ideal for use when building a chicken run. 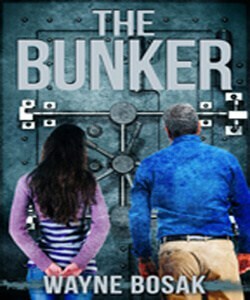 The run does not need to be tall enough for a human adult to walk through without hunching over, or even enter at all. But, I find it extremely helpful to be able to walk inside easily, without being all hunched over, especially when inspecting chick health or dealing with an injured bird. 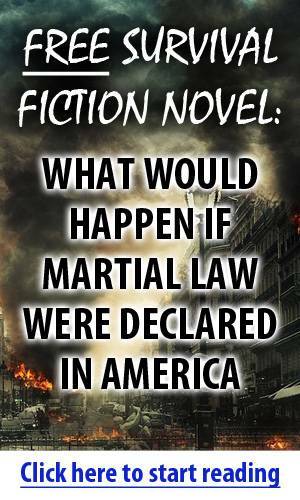 If you want to be able to do the same, use 7-foot tall T-posts or wood posts pounded 1-foot into the ground to ensure they are firmly positioned and will not sway in the wind of when the ground becomes saturated with water. 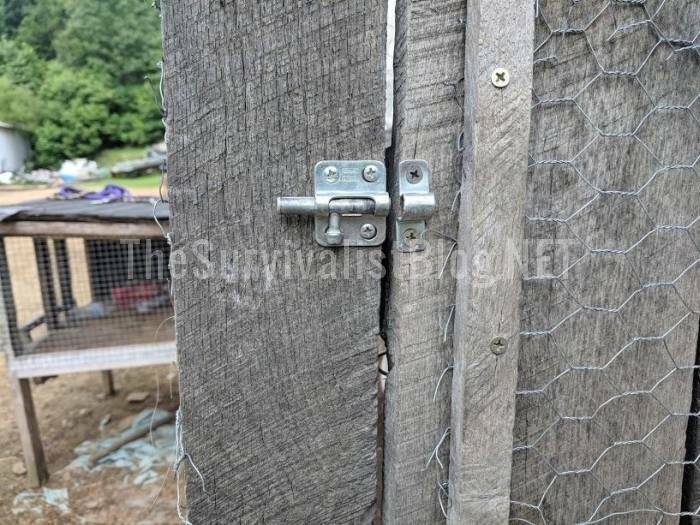 A 2-step lock was placed upon the chicken run door to make it as difficult as possible for raccoons to unlatch it. A raccoon is fully capable of opening a single step non-key entry lock. I placed the latch high enough up on the door to force a raccoon to attempt to climb to reach it, but not so high the young grandchildren could not open it themselves. 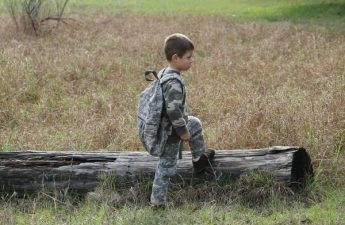 We teach the children homesteading and self-reliance skills from a very young age on our survival homesteading retreat. Learning how to care for chickens and teaching them where their food comes from, begins shortly before age two around here. Being tasked with egg collecting is also a great way to not only drive home those two points, but to teach responsibility as well. 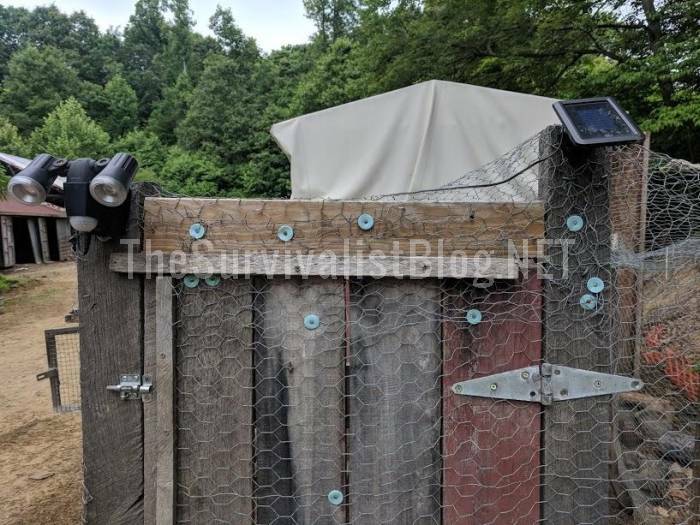 The run door was made of hardwood and covered on the outside with a combination of chicken wire and hardware cloth to protect and opening that could be created as the boards age, get pecked or kicked by livestock, or separate due to inclement weather. 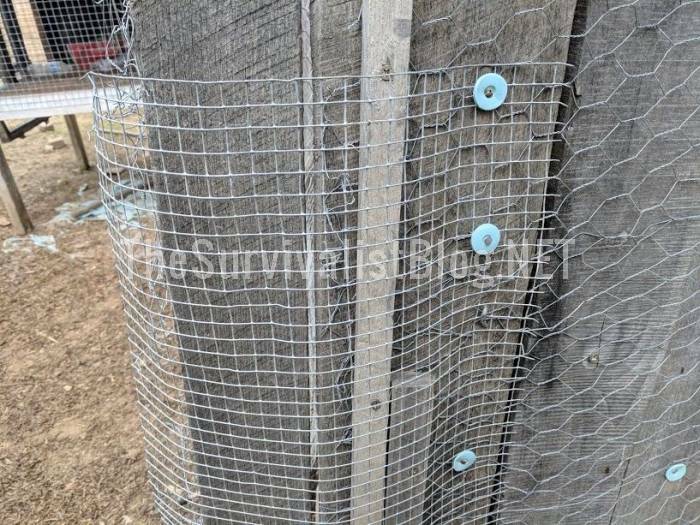 Instead of nailing the wire that formed the roof of the chicken run onto the inside of the board, we stretched it to the exterior portion of the board to avoid sagging or gaps a predator could take advantage of over time. A hawk landing on the top of the run repeatedly while attempting to get inside, can pull thin or slack wire aparat enough to create an opening predators could use to get inside. If the run was going to be used to house chickens full time, I would have opted instead for a wood roof covered in metal to better shield the birds from both the weather and predators. Some folks use a staple gun to attach hardware cloth or chicken wire to livestock pens, but those are not the most secure options. Purchasing round plastic tabs that slip over the heads of nails (shown in green in the photos) holds the wire firmly in place. You can also use barbed wire fencing staples, the thick ones that have to be pounded in with a hammer, to hold the wire in place. We used those type of staples when attaching the chicken run wire to the exterior walls of the chicken coop. On top of the door is a solar-powered motion detector light that was purchased for around $20 to $25. The light detects even the slightest movement and is bright enough to attract our attention via a window in our home – that is about one quarter of a mile away from the chicken coop. The hinges on the chicken coop run door might look like overkill, but I intentionally purchased large, wide, and thick ones to ensure the door would remain tightly affixed to its posts and not allow for any gaps that a predator could sneak through. The flock run entry door from the coop is simply a piece of wood cut to fit and placed upon hinges. My homesteading neighbor Sarah, used a wood toilet seat to make her run entry door and it not only looks kinda cool (she painted a design on it) but works great and made use of an item she would have simply discarded because it was worn. She turned the toilet seat upside down to the lid folds down to the base of the run. Attaching some motion detector decoys to or around the run will also help keep predators away. I have a motion active owl perched on top of the chicken coop and large black eyes painted on one side to scare hawks away – that kinda works. 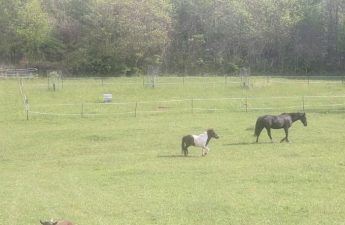 Inside the run you should place a dog box or rubber tote turned sideways to offer protection from the elements – including the sun, if using the run on a daily basis to house the entire flock, on exercise yards that do not have a wood or metal roof. I never fed the flock inside the coop, their feed was always placed in the run to deter both mess and the attraction of predators when spills occurred. Spills still happen in the run, but they food is quickly mushed into the dirt base. Placing a large water in the run and not the coop will also help dramatically to curtail mess on the floor of the primary living quarters. In addition to the water shown in the photos, I also use a waterer that hangs on the outside of the run and the fountain-like drinking cups attach from the inside of the coop. This type of waterer seems to prevent water waste and mess the best, but during the warm weather months I place both waterers in the run to prevent the flock from every running out of water. The hanging exterior waterer also makes it easier to pour medicinal herbs, spices, and flowers into it as part of my regular flock health routine. Boredom busters are also highly recommended for placement inside a chicken run. Because I do not regularly keep birds in the run for an extended period of time, it may indeed look a little boring in their. I used an old sawhorse to make a bird, the birds love to be as high as possible – yet another reason to create a chicken run tall enough for you to walk inside. There also is usually a swinging perch attached to the sawhorse, the young chicks tend to love this feature. Hens really enjoy taking a daily dirt “bath.” The beloved social activity your hens will do together not only serves as a boredom buster, but is also good for their health. The dust bath will help deter or get rid of mite infestations. To create a dirt bath in the chicken run, simply put some dirt inside an older tire or plastic tub and place it away from the waterer – the hens get pretty excited and flop around a lot when taking their dirt bath. When birds become bored, they tend to not only pluck their own feathers, they can also peck each other relentlessly, sometimes to death. Being kept in a small space with nothing to do can make the flock members become rather aggressive or standoffish with their caretakers as well. You want your birds to run to you and not away from you. When this type of trusting relationship is built, they will be easier to find if they escape, when teaching how to free range, during health checks, and when dealing with an injured or ill bird. It must not snow where you are!